The collagen and elastin structure of our skin decreases as we age, this is a normal process of life resulting in the skin’s loss of elasticity and firmness. The reduction of collagen and elastin makes the skin lose its natural ability to be moist and rejuvenated. There are a few other factors that contribute to the loss of elasticity in the skin such as excessive sun exposure- The harmful UV rays of the sun make the skin dry and dull; Unhealthy lifestyle and activities such as obesity, excessive alcohol intake, smoking, and the use of wrong skin care products contribute to skin damage. 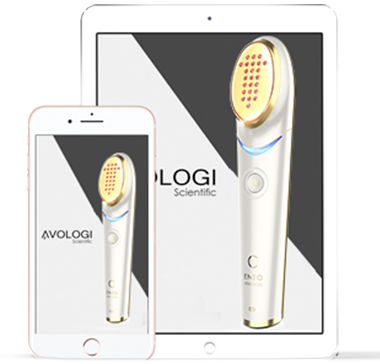 Avologi's medical devices light-based treatments use red & infrared light with precise wavelengths of 633nm and 830nm. The light beams penetrate the epidermis layer allowing it to perform intracellular stimulation in the dermis layer for the reproduction of new cells. A boost in collagen and elastin production makes the skin more resilient, firmer, and tighter in the process. It also helps retain the skin moisture and improves skin tone and texture. Avologi's medical devices are FDA cleared, non-invasive and effective starting the first treatment.